Ghost Town is the latest in the Video Redeption gaming. Up to four players can enjoy this ticket redemption shooter which features a massive 55 Inch LCD Widescreen monitor and 4 vibrating gun controllers. With an attractive Deluxe cabinet, awesome sound effects and varying bonus rounds and gameplay, Ghost Town is sure to be a major drawcard for any gaming location! Ghost Town is the latest in the Video Redeption gaming. 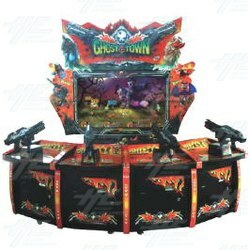 Up to four players can enjoy this ticket redemption shooter which features a massive 55 Inch LCD Widescreen monitor and 4 vibrating gun controllers. With an attractive Deluxe cabinet, awesome sound effects and varying bonus rounds and gameplay, Ghost Town is sure to be a major drawcard for any gaming location! This is a fan video from Allison Timberlake of the Ghost Town video redemption machine. Short, factory-made video showing Ghost Town arcade video redemption machine prior to shipping.